Xiaomi has become one of the world’s largest smartphone vendors by making compelling devices for price-conscious consumers. The company knows what its customers want. 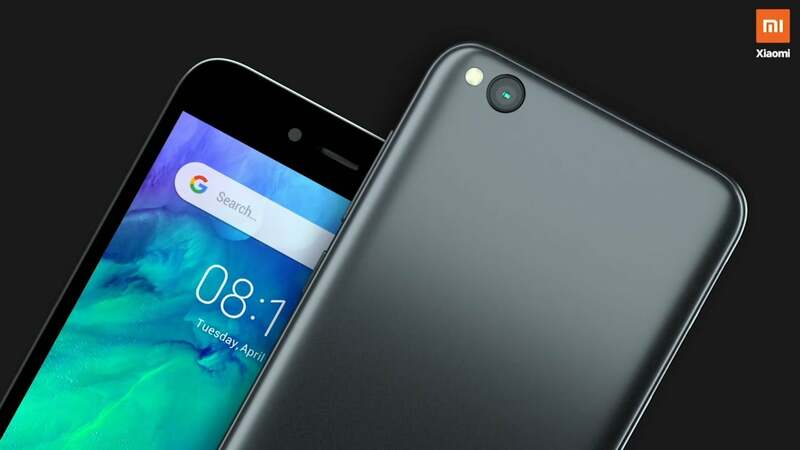 Recently, the Chinese vendor launched a feature-rich smartphone in markets like China, India, and the Philippines for just $65. It’s called Redmi Go. There are only a few good competing devices in this price range, and one of them happens to be Xiaomi’s own Redmi 6A. Here we take a detailed look at how the Redmi Go stacks up against Redmi 6A to help you decide which phone is right for you. Both the phones are aimed at budget-conscious consumers in emerging markets. So, don’t expect any flashy design elements. They both have thick bezels at the top and bottom of the screen. The rear panel is made out of plastic and the design looks dated, but the build quality is reliable. Curved edges on both phones offer a good grip. The Redmi Go measures 140.4 x 70.1 x 8.4 mm and weighs 137g. The Redmi 6A is a little heavier at 145g. It measures 147.5 x 71.5 x 8.3 mm. The Redmi 6A comes in Gold, Black, Rose Gold, and Blue colors. The Redmi Go is available only in Black and Blue color options. They both rely on a microUSB 2.0 port for charging. Also, they retain the 3.5mm headphone jack. Neither phone has a fingerprint sensor for authentication and security. Considering the price point, you shouldn’t expect fingerprint sensors on these devices. Both the Redmi Go and Redmi 6A feature excellent displays for their respective prices. 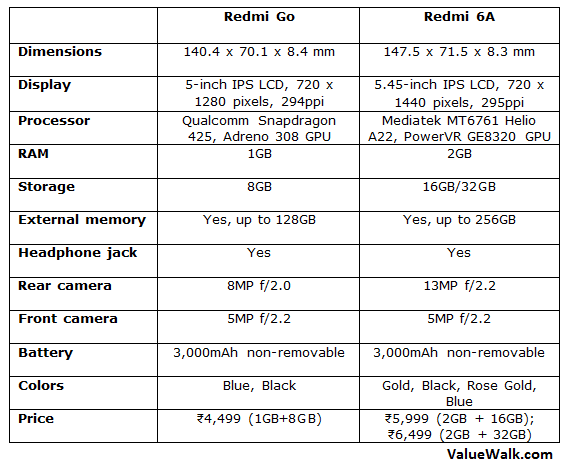 The Redmi Go sports a 5-inch HD LCD panel with 720 x 1280 resolution. It has a 16:9 aspect ratio, 70.0% screen-to-body ratio, and 294ppi of pixel density. Neither phone’s display is protected by Corning Gorilla Glass. The Redmi 6A gets a slightly bigger 5.45-inch HD+ LCD screen with 720 x 1440 pixels resolution. It has a bigger 18:9 aspect ratio, 295ppi of pixel density, and 72.7% screen-to-body ratio. Both phones offer good viewing angles and color reproduction. The Redmi Go runs a quad-core Qualcomm Snapdragon 425 processor, same as the older Redmi 4A phone. The processor is paired with Adreno 308 GPU and 1GB RAM. The phone offers 8GB of internal storage and supports external storage of up to 128GB via a microSD card slot. You can’t play high-end games on it, but it’s a decent performer for the price. It’s powerful enough to run multiple apps. The Redmi 6A gets a slightly more powerful MediaTek MT6761 Helio A22 chipset with PowerVR GE8320 graphics processor. It comes with 2GB RAM and 16GB or 32GB of internal storage. It also features a microSD card slot for external memory of up to 256GB. Both the handsets get the same non-removable 3,000mAh Li-Ion battery. The battery is large enough to get you through a full day of normal usage. But they lack fast charging, which means they take longer to charge. The phones take more than two hours of fully charge. This is where you’ll notice a big difference between the two handsets. The Redmi Go is part of Google’s Android Go program. It runs the stock and lightweight version of Android 8.1 Oreo (Go Edition) without any bloatware or custom skin. The user experience is smooth and simple. Google optimizes the Android Go software to deliver a smooth experience on low-end phones. The Redmi Go runs Google’s Go Suite of apps such as Maps Go and Google Go Assistant. However, you shouldn’t expect timely software updates and security patches on the device. The Redmi 6A runs Xiaomi’s custom MIUI 9 skin on top of Android 8.1 Oreo. It is loaded with bloatware. The Redmi Go gets an 8-megapixel main camera with an f/2.0 aperture and an LED flash module. It is capable of recording videos at 1080p Full HD resolution. There are also real-time filters, HDR support, and smart scene detection. On the front, it features a 5-megapixel lens with an f/2.2 aperture. The camera takes pretty decent pictures. The Redmi 6A features a 13-megapixel lens with an f/2.2 aperture on the back. The camera is supported by PDAF, LED flash, HDR, and panorama mode. It captures better details than Redmi Go in both bright light and low-light conditions. There is a 5-megapixel lens on the front for selfies. Xiaomi has priced the Redmi Go at ₹4,499 in India, which is equivalent to roughly $65. The Redmi 6A is available at ₹5,999 for the 2GB RAM and 16GB storage variant, and ₹6,499 for the model with 2GB RAM and 32GB storage. Both phones are value for money devices. The Redmi Go is aimed at people who want to upgrade from feature phones to smartphones. The Redmi 6A is for people who want a bigger display and more processing power at affordable prices.